People that receive Thru download links that require Java will need to install and configure Java to work with their browser. Following are the steps to activate Java in Microsoft Explorer and Mozilla Firefox on Microsoft Windows. Restart the browser. Firefox will display a dialogue box to prompt the user to allow / block the plugin. Click the Select All button. Following are steps that may be needed to enable Java download in Safari on Mac OS. By default Java is set to run in “safe mode” which does not allow saving files on disk. To enable file saving using Safari, changes are needed under Manage Website Settings preferences. Select Java in the left panel menu. 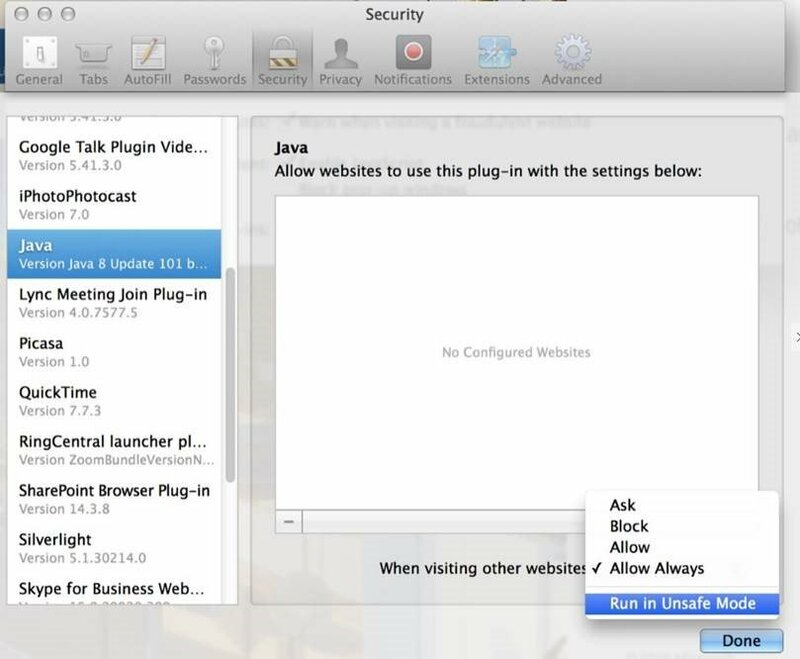 Then select Run in Unsafe Mode next to When visiting other websites.